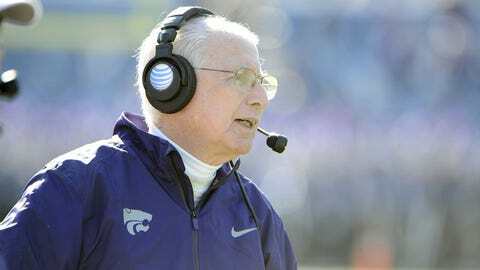 Bill Snyder doesn't know why the Wildcats have struggled in recent bowl games. MANHATTAN, Kan. (AP) Under Bill Snyder, Kansas State went from arguably the worst program in the history of college football to a perennial contender, a job nobody thought possible. Snyder stepped away for a brief retirement, only to return and lead the Wildcats back to the Big 12 championship. So when it comes to football in the Flint Hills, most people believe Snyder has all the answers. But even Snyder is puzzled by Kansas State’s struggles in bowl games, especially of late. When the Wildcats play Michigan in the Buffalo Wild Wings Bowl on Dec. 28 at Sun Devil Stadium in Tempe, Ariz., they’ll be trying to end a five-game losing streak that dates to Snyder’s first tenure at Kansas State and includes a loss in the only bowl game that Ron Prince was on the sideline. The Wildcats lost two Fiesta Bowls — after the 2003 season to Ohio State, starting the streak of futility, and last season to Oregon. They lost the Texas Bowl in ’06, the Pinstripe Bowl four years later once Snyder had returned, and the Cotton Bowl to Arkansas the following season. Some of the defeats were close (36-34 to Syracuse at Yankee Stadium), while some of them were the kind of runaways that are just as soon forgotten (37-10 to Rutgers in the Texas Bowl). Most people thought the Wildcats would be headed to the Holiday Bowl, and that would have boded well for ending the streak. Snyder has never lost in three trips to the game in San Diego, and a win over Arizona State on Dec. 27, 2002, remains the Wildcats’ most recent bowl victory. Instead, the Wildcats moved one spot up the pecking order and are headed for the bowl game formerly known as the Copper Bowl and Insight Bowl, and one that has plenty of Kansas State history. In 1993, the Wildcats headed for the desert for just the second bowl game in school history and the first under Snyder, and wound up routing Wyoming 52-17. It was a watershed moment for the program, not to mention a fan base so starved for success that it descended on Arizona like a purple wave. To this day, it remains one of Snyder’s most cherished memories. The Wildcats returned to the game in 2001, when it had been renamed the Insight.com Bowl and had moved from Arizona Stadium in Tucson to Bank One Ballpark in Phoenix. In fact, bowl games often have left a sour taste in Snyder’s mouth. He’s won only six of his 14 games as coach of the Wildcats; the other eight times he’s spent an offseason ruing a defeat. That leaves Snyder stumped. He insists the preparation isn’t any different than any other time of year, and he’s a master at limiting distractions when his teams play away from home. In fact, he tends to have a schematic advantage over rival coaches when he’s given extra time to prepare, so the fact that Kansas State has struggled so much in bowl games is downright baffling. One thing that Snyder knows without any shred of question is it’s important for Kansas State to finally end its drought, especially against a blue-blood program such as Michigan. “I don’t think about it along those lines,” Snyder said, “but I think our players do. This is really important for them because they, in their tenure here, have not been successful in the last game of the season or the bowl games that they have participated in.